This caramel corn is a great frugal snack or dessert idea. The recipe came from my husband’s grandmother. When we got married she gave me her favorite cookbook. She said she really did not cook much anymore and she wanted me to have it. It was a church cookbook from a church they had attended at one point. It is a large cookbook and has lots of good recipes. This is my favorite recipe from that cookbook. I made this recently for a movie night with the kids. I had not told them we were going to have a movie night but when they saw me making caramel corn they knew we were going to have one. So, for a frugal movie night at home, get a movie from the library and make a big batch of this. It is a great treat or snack for a movie or anytime. My tip on this recipe is it is easier to stir the hot caramel sauce into the popcorn if you have two people. It just makes it easier to get it well coated. This recipe is easy but if you have never made anything like it before I would suggest you 1/2 it the first time in order to get the idea about stirring all the sauce around. And one more thing, yes the caramel sauce bubbles up when you add the baking soda to it. It is supposed to do that. Place popped popcorn into one very large bowl or pan or 2 medium to large bowls. In a pan bring the brown sugar, corn syrup, butter, and cream of tarter to a boil. Boil for 5 minutes. Stir in the baking soda quickly and remove from heat. Pour over corn and stir well. The caramel sauce should coat the popcorn. Spread onto 2 foil lined baking sheets. Bake at 200 degrees for 1 hour. 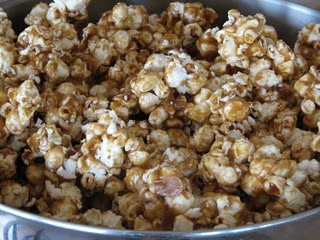 I rotate the sheets around and stir the caramel corn after 30 minutes and then bake 3o minutes more. 1 hour total should be enough. This is not crisp when you first take it out. It will harden up some as it cools on the sheets. Break up place in bowl and serve. That looks really similar to my recipe. I love caramel corn. It’s so reasonable to make it at home, too. Oooh, yummy! What is cream of tartar anyway? You find the cream of tartar in the spice aisle with all the baking products and spices. You really do not use it much. It helps when beating egg whites up for meringue. I have had the same bottle of cream of tartar for several years so it is not something you use much but it is not expensive to buy at least not from what I remember. You do need it for this recipe though. It is what makes this recipe work better then other caramel corns I have tried. That looks delicious! I’ll have to try that. Thanks! Omigosh! That looks SO yummy! I’ll have to try that. I’m always looking for something good to make at home. I think this would make a great tip to share with the other moms who read my blog! Thank you so much for participating in Mommy Tip Tuesday – I really appreciate it!